This is a statue in Cherokee, North Carolina. The lettering on the side of the bear is the Cherokee alphabet. 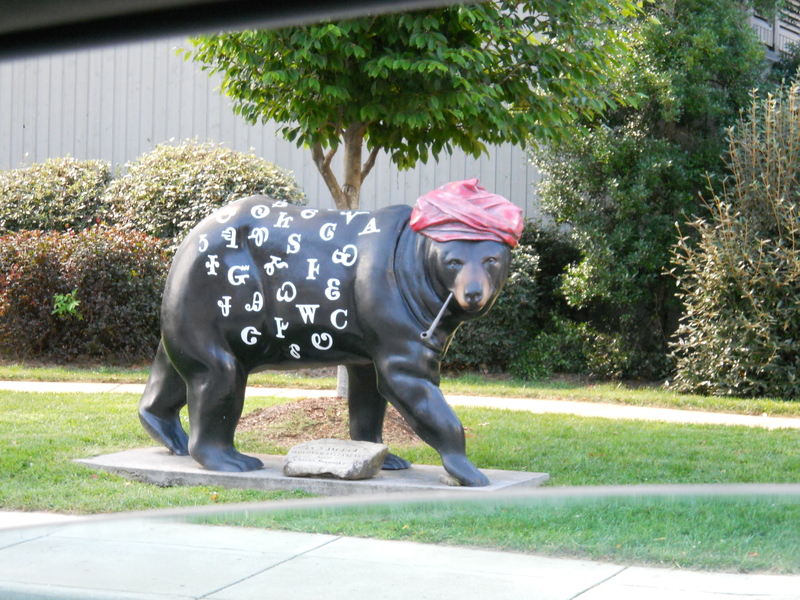 The bear is a nod to Sequoia, the Cherokee who created the alphabet. In photos Sequoia is seen smoking a pipe like that one and wearing a loose turban on his head. It is easy for many people to respect Native Americans and their culture. Just like the Amish from a blog a couple of weeks ago. They keep to themselves mostly and do not threaten the larger society. Many people enjoy thinking of Native Americans, like Cherokee, as mysterious and very spiritual. I cannot speak for the Amish, but I am half Cherokee and I feel pretty comfortable after a lifetime of family and research to say that Cherokee now, or in the past, are not mysterious by nature – and while they were in touch with the earth in order to survive in the past, not extremely spiritual either. There are many misperceptions about other cultures that we all have. My family is just like yours. There are spiritual people in my family. There are also people who are not joyful about life or one another. There always has been. Each person in every family is unique. I am not sure, but I would guess there are very loving and very grouchy Amish people too. Cultures are made up of individuals and on many levels we are very much alike. It is important to keep an open mind when we consider other cultures. When we stay open, we stay respectful.